With four weekends and seven races in the bag, we've reached the halfway point of the 2015 Garmin Hamble Winter Series. The winds have been predominately light, and the weather unseasonably warm for the Autumn. These conditions of course have meant shifts a-plenty for competitors racing in the central Solent - not to mention a challenge for race officers Kathy Smalley and Stuart Childerley to set their courses. When the series resumes on Sunday 8th November, there will be one race a day scheduled, meaning that boats with gains to make will have to work hard to make their gains in the four races remaining. Blackjack II leads IRC 3 overall, with a near-perfect score spoiled only by a second place in race 7. 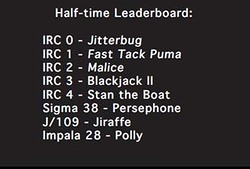 Likewise, Malice has had a good run so far in IRC2, but even a seven-point lead is not unassailable in a closely-matched fleet like this. But in other classes, things are by no means so clear-cut. In IRC 1, Fast Tack Puma is only three points ahead of Old Mother Gun, and with four races remaining, anything could happen. In IRC 4, Stan the Boat lies three points ahead of second-placed Polly. Likewise in the J/109 class, Jiraffe leads Jolly Jack Tar by three points, and in the Sigma 38s, last year's Yacht of the Series, Persephone of London, is a mere two points clear of second-placed With Alacrity. place, with only six points separating 2nd and 5th place. Uproar is currently lying second at the halfway stage. Thanks go to our day sponsors, which have included the Impala 28 class, Force 4 Chandlery, The Bugle and Wadworth's Brewery providing prizes for the highest-placed competitors present at the prizegiving, so it's well worth heading to HRSC after racing! Thanks to all competitors and to the volunteer race teams and shoreside helpers for their dedication so far - and we look forward to seeing you on the 8th November. Don't forget to Like us on Facebook, where our photos and videos regularly reach over 6,000 people. 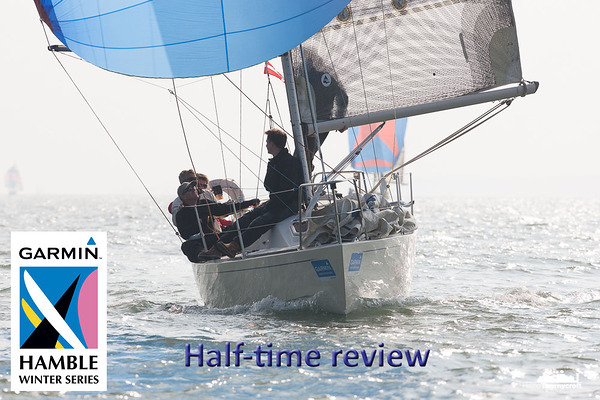 Thanks to this year's tides, the Sailing Networks Hamble Big Boat Championship was this year run alongside the Doyle Sails Hamble One Design Championships on the 2nd and 3rd weekends of the Garmin Hamble Winter Series. The race team, led by international race officer Stuart Childerly, offered top-notch racing for some of the best-sailed big boats in the country in surprise Indian Summer conditions. Competitors came from across the Solent for quick turnaround races on windward leeward and round the cans courses. Furthest-travelled prize this year went to the crew of GP42 Hispaniola. They travelled from Scotland to race the first weekend having only just bought their boat in Germany and missed the first race thanks to their plane being delayed in Scotland! The 2015 event proved popular with competitors, and was a resounding success, featuring close racing, great race management and excellent courses over four days and 12 races. This year the event was sailed in mainly light winds, which made the racing closer than ever. The biggest boats raced, as ever, in the IRC 0 class. This was won by Rod Stuart and the crew of Corby 37 Aurora, with an impressive 6 firsts out of 12 races. Stewart Whitehead's Carkeek 40 Mk2 Rebellion took 2nd place, with current Garmin Hamble Winter Series leader Jitterbug in third overall, four points behind Rebellion. In IRC 1, it was Simon Henning's Mumm 36, Alice that won the Big Boat Championship, an impressive 9 bullets giving them a healthy lead over Jim MacGregor's second-placed Premier Flair, who pipped Richard Patrick's Dusty P for second place. Thanks go to all competitors and to sponsor Sailing Networks for their support, and we look forward to seeing you all on the start line next year. Neither weekend of the Doyle Sails Hamble One Design Championships came with a particularly promising forecast, but the race team, headed by Dermod O'Malley, got all races away in light airs to give the assembled J/70s, J/80s, SB20s and Mixed Sportsboats some great courses and close racing. Over the two weekends, 10 short, sharp races were sailed with a quick turnaround in between, which was appreciated by crews including J/24 world champion Ian Southworth, who praised the race team's efforts.The tricky conditions saw boats splitting tacks up the beats to take advantage of the numerous shifts, some reaping their rewards and others losing out as they neared the windward marks. Points-wise, no boat had it all their own way in the J/70 class, but it was Tom Forrester-Coles' Harlequin that took home the trophy, finishing the series with 18 points, six clear of second-placed Jugador, belonging to Jack Davies. The podium was completed by Greg Hall's RTYC 742, with 32 points. And with that, the 2015 Doyle Sails Hamble One Design Championships concluded. We look forward to seeing entries from as many classes as possible next autumn, and would like to thank all competitors and Doyle Sails for their support of the event.